Hughenden, a rural town, is 320 km south-west of Townsville. It is situated on the Flinders River which has its headwaters in the Dividing Range about 100 km to the north-east. The Flinders, together with several other watercourses and an average annual rainfall of about 485 mm provide good pasture on the generally black soil, basaltic plains around Hughenden. In 1861-62 two search parties for the Burke and Wills expedition, the Landsborough and Frederick Walker expeditions, reported favourably on the pastoral prospects around the Flinders River and the Jardine Valley. Several pastoralists set out for the district. The first of them, Ernest Henry, took up five pastoral runs, one of them named Hughenden after his grandfather's property in Buckinghamshire, England. In 1877 a township was surveyed and named after Henry's pastoral station. 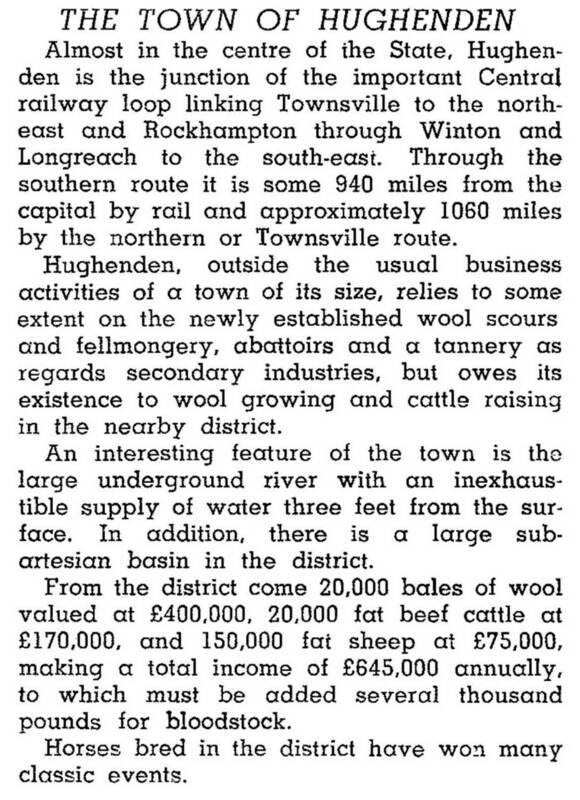 Somewhat in advance of the railway reaching the district, Hughenden was a prosperous pastoral area. 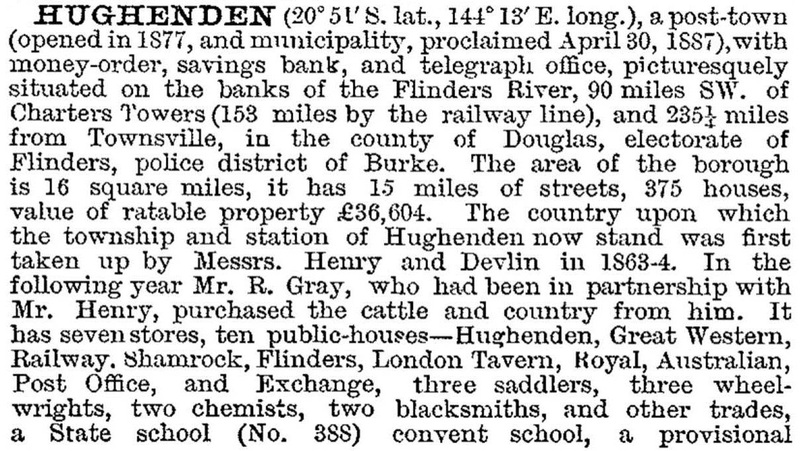 By 1882 Hughenden had a court house, two hotels, stores, a hospital, a post office, a school (1880) and a Jockey Club. It was the administrative centre of the Hughenden local government division, separated from the Doonmunya division in 1882. The 1880s were a time of remarkable expansion. Anglican and Catholic churches were opened, the Ensign newspaper was started and the railway from Townsville reached Hughenden in 1887. The town was also made a municipality separate from the shire. The 1890s were contractionary: shearers' strike (1891) and a recurrence of unrest in 1894; outbreaks of cattle tick and typhoid (1895) and extension of the railway to Winton, ending Hughenden's ten year period as a railhead for the western pastoral region. One bright spot had been the successful tapping of artesian water at Lammermoor, south-east of Hughenden, in the early 1890s. 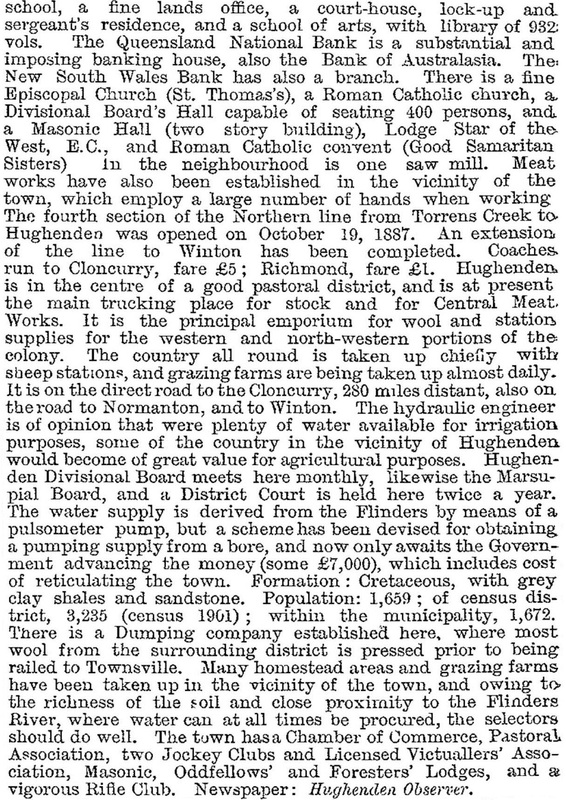 A bore for town water was completed in 1904, and Hughenden gained a reputation for good water for travelling stock and locally grown citrus and vegetables. The 1900s also saw the opening of a convent school and Presbyterian church (1908). The North Western Pastoral, Agricultural and Industrial Association (1883) ran well attended annual shows, a regional showcase lasting over five days with a two day race carnival and an annual ball. Hughenden developed as a regional service and shopping centre and from the 1920s to 1960 there was a steady growth in population. The Olympia Theatre (1923) and a town electricity supply (1928) put the town at the forefront of up-to-dateness. Civic progress triumphed over natural and non-natural adversity: there were ruinous fires that burnt down stores, hotels and council chambers, plus floods (1917 in particular) and a tornado (1949). These events were remembered but did not inhibit rebuilding. Postwar wool prosperity provided funds for an airport (1952), a swimming pool, new council offices (1956) and a new hospital (1958). Local wool scours, an abattoir, a fell-mongery and a tannery did not survive long into the post war years. In 1959 the town and shire councils were amalgamated. Still buoyant, the town economy funded a new convent school and the Great Western Hotel added a motel. Hughenden, however, had just passed its apex and every subsequent census reported a loss of people, with the population halving from 1961 to 2011. Hughenden is the railway junction for the lines to Winton and Mount Isa, and is the junction of the Flinders Highway and the Kennedy Developmental Road. It has a comprehensive shopping centre for the Flinders Shire, two hotels, two motels, a showground, a racecourse, golf and swimming venues, churches, a State high/primary school, a Catholic primary school (1900), a hospital, an information centre and a dinosaur display. Its Grand Hotel ceased trading in 2004 but is on the Queensland heritage register. An entertainment centre was built in 2002.